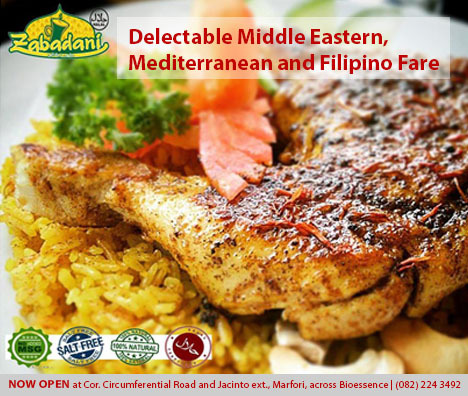 Zabadani, home of delicious Mediterranean – Filipino cuisine, is officially open for public at their new location: cor. JA Sarenas Avenue (Circumferential Road) and Jacinto ext, across Bioessence Spa. They just transferred last August 2015, and with a few final work, the 190-square meter space is now a 26-table gastronomic destination. The new Zabadani site also houses a 20-seater mini function room and a 20-square meter coffee shop. With a bigger space, better parking and a convenient location, Zabadani is truly excited to re-open to the public. They’re also extending their menu, opening up their kitchen for bigger catering services, improving the dish servings, and have lined up a few marketing promos for the rest of the year. “We are grateful to everyone who helped us, truly Allah (subhanahu wa ta’ala) been The Most Kind. We also owe our success to our patrons and to our lovely city, and we will strive to become a better brand and a better restaurant in general.” This is a message from Wadi Mutia, the founder and Operations Manager of Zabadani. Opening event ceremonies event coordination, entertainment, decor and styling by PREP. Photo and video documentation by Visual Insights Multimedia.